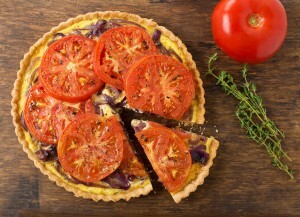 Red, ripe tomato slices bring fresh flavor and bright color to this tart. Place sheet of dough on a lightly floured surface. Roll to a thickness of 1/8 of an inch. Carefully ease dough into tart pan and gently press it into bottom and up sides of pan. Trim off all but 1 inch of excess. Fold overhang back into pan and press firmly against sides, this will create a double layer of dough which will reinforce the sides of the shell. Line pastry shell with a double thickness of foil. Bake for 5 minutes. Remove foil and bake for an additional 5 to 7 minutes or until pastry is nearly done. Remove from oven. Reduce oven temperature to 325 degrees F.
Warm 2 tablespoons of the olive oil in a large skillet, add onions, and cover. Cook over medium heat, stirring occasionally, until softened, about 20 minutes. Remove lid and cook until onions are golden and liquid has evaporated. Remove skillet from heat and set aside. Combine eggs, ricotta cheese, Parmesan Cheese, garlic, nutmeg and 1 tablespoon of the thyme in a medium-size bowl. Whisk until well blended. Spread cheese mixture over dough. Spread onion mixture over cheese. Arrange tomato slices in concentric circles over onion mixture. Season with salt and pepper to taste. Stir the remaining olive oil and thyme together and brush over tomatoes. Bake in a 325 degree oven for 30 to 35 minutes. Cool slightly before serving.